LEGO Batman 3: Beyond Gotham for PS4, PS3, Wii, Nintendo DS3, Xbox + Vita As Low As $14.99 (Reg. $19.99 + Up)! You are here: Home / Great Deals / Amazon Deals / LEGO Batman 3: Beyond Gotham for PS4, PS3, Wii, Nintendo DS3, Xbox + Vita As Low As $14.99 (Reg. $19.99 + Up)! 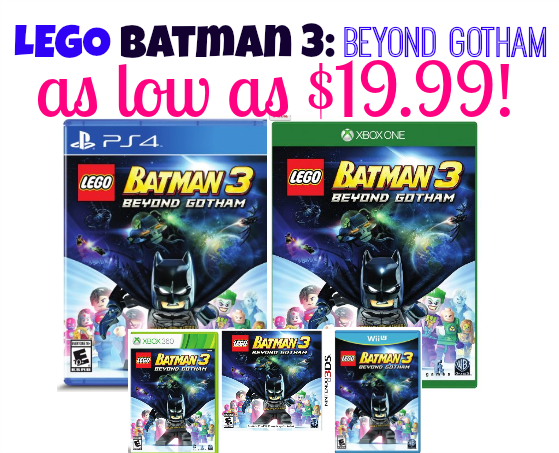 LEGO Batman 3: Beyond Gotham for PS4, PS3, Wii, Nintendo DS3, Xbox + Vita As Low As $19.99! – LEGO Batman 3: Beyond Gotham Season Pass [Digital Code] – only $14.99 (compatible with Playstation devices) Best price!! Plus, FREE Shipping is available with Amazon Prime or FREE with orders of $35 or more (sign up for a FREE 1 month trial here)! This is slotted to arrive before Christmas at the time of the post.